Today President Obama delivered a much anticipated landmark speech on the efforts of the United States to combat climate change. Obama proceeded to lay out his administration’s new plan to address climate change on a number of fronts, including preparing to adapt to some already unavoidable and dramatic impacts. We’ll detail that plan in the next post, but here’s some of what Obama had to say during his inspirational climate speech. Obama hit back at critics of strong American climate change action. He asserted that people who say the American people and American businesses are not up to the challenge of solving climate change while leading and innovating need to just “Look at our history”. He maintained that the tired excuses for inaction show “a fundamental lack of faith in American business and American ingenuity”. Obama attacked those who deny climate change exists, and called on young people to help move the needle of climate action forward. “I don’t have much patience for anyone who denies that this challenge is real. We don’t have time for a meeting of the flat earth society. Sticking your head in the sand might make you feel safter, but it’s not going to protect you from the coming storm. And ultimately, we will be judged as a people and as a society and as a country on where we go from here”. Appealing to young people and their future, Obama said, “We’re not a people who fear what the future holds, we shape it. What we need in this fight are citizens who will stand up and speak up and compel us to do what this moment demands. Understand, this is not just a job for politicians. So I’m going to need all of you, to educate your classmates, your colleagues, your parents, your friends”. In surprise remarks, Obama even brought up the controversial Keystone XL tar sands pipeline. He mentioned that his Administration is in the final stages of evaluating the proposal, but will find it difficult to approve the pipeline if the net result is that it adds to the world’s carbon emissions. It’s very difficult to see how it would not. Perhaps Obama mentioned the pipeline, even though top staff had said he would not today, because fellow Democrat Al Gore recently called the proposed Keystone XL pipeline “an atrocity”, and pressured Obama to veto it. 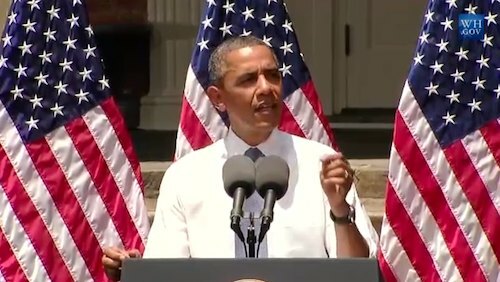 Obama’s speech contained the most forceful remarks on climate action from him during in his years in office, and indeed from any president for many years. Following is a video of Obama’s full speech. It’s worth watching. This may be a turning point for American action on climate change, and as he acknowledges, for the world as a whole. Although carbon emissions from the United States have been dropping in recent years, it is still the second largest emitter in the world, so action to address emissions will have an important impact. And if the Unites States begins to take strong action, others countries will too. In our next post, we’ll lay out the key points in Obama’s climate plan. Notably, and as expected, all of the actions do not require the approval of Congress, so it’s entirely possible they will be put into action, even if there is strong opposition. Update: Now read Obama’s New Climate Plan: Top 10 Points You Need To Know.